When I was in California with David's family, I excused myself to spend an afternoon and evening with my very dear friend C., who lives in Oakland. It was a chilly, rainy day, and after a brief walk in Lake Temescal park (where I took the above picture), we curled up on C.'s sofa and watched Seeta aur Geeta. 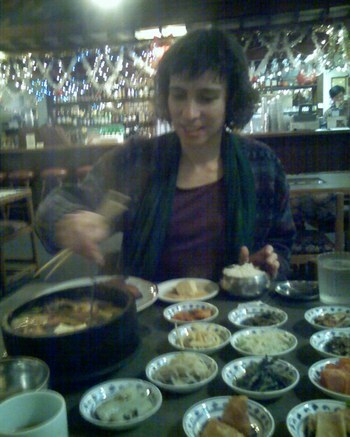 Then we went to a Korean restaurant called Jong Ga House, on Grand Avenue at the edge of Lake Merritt. C. had taken me to this restaurant once a couple of years ago, and I haven't stopped raving about it since, so I was delighted to go back. It is the best Korean food I have ever had. The fun begins right after you place your order. Most Korean restaurants that I've been to give you one or two side dishes - some kim chee, a little pickled bean sprouts, maybe some seaweed. 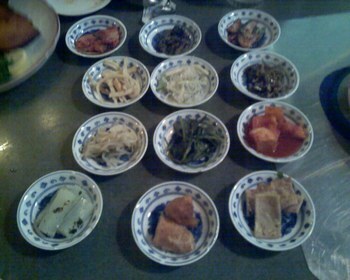 At Jong Ga House you get no fewer than the 12 side dishes shown above. There's the kim chee and the bean sprouts. There is also pickled cucumber (delicious! ), spiced tofu, pressed fried tofu, fried potato, several kinds of seaweed, and some other tasty little bites that I can't even identify. The entrees are excellent too. There is a delectable a broiled flat fish - moist and tasty with a perfectly crisp salt crust. We also ordered a spicy fish and tofu stew served in a sizzling hot pot. Here's C. serving herself some stew. After you are done with your entrees at Jong Ga House, the server brings a sweet and refreshing rice drink to top it off, a perfect finish to a perfect meal. 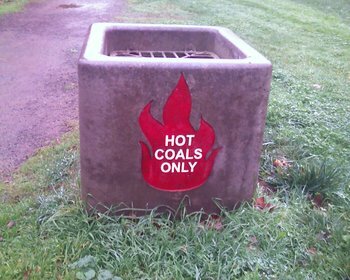 Our only complaint about this visit was the music. A satellite channel of Christmas songs was playing - which would have been bad enough on its own - and in the course of our meal, we heard not one or two but four different versions of a vapid, inane pop Christmas song "Last Christmas I gave you my heart." I wouldn't be surprised if there is a room in hell where all the incarnations of that dreadful song play in an eternal loop.